The second Doctor and Jamie, acting on behalf of the Time Lords, visit Joinson Dastari, head of projects on space station Camera, in an attempt to stop a series of dangerous time travel experiments. What the duo don't realise is that Dastari has been genetically enhancing an Androgum, Chessene o' the Franzine Grig, who is using her new found intellectual powers to her own ends. Meanwhile, the sixth Doctor also decides to visit Dastari only to find the space station in ruins. The Two Doctors should have been a masterpiece. A Robert Holmes script, the return of Patrick Troughton, the Sontarans... Unfortunately, some unsympathetic direction, bad design and poor casting all but ruin it. The fact that the story is even slightly watchable is almost a miracle in itself. Instead of the Androgums being played as hard, brutal killers the enhanced Chessene (Jacqueline Pearce) comes across as dull and boorish while the butcher Shockeye (John Stratton) is more Carry On than Sweeny Todd. Dastari, a modern-day Frankenstein, is turned into a dolt by Laurence Payne who seems to think his character is suffering from some kind of sleeping sickness. And whose idea was it to cast tall actors for the Sontarans? They're supposed to be short and stocky, not tall and thin - a problem made worse by a lack of padding in their costumes which lets their supposedly airtight helmet brace flap around like an old tyre on a fence post. The real irony is that the script is generally strong. Imagine Shockeye's lines being delivered with implacable calm or Chessene being played with depth and guile, picture costumes that aren't comedy classics and some direction that doesn't play up the story's camp potential... it's suddenly very good. But like so much of the show's output from this era a solid idea once again gets buried by a light entertainment ethos that went out of date when the world was still black and white. Think Charlie Drake in The Worker. The plus points are everything else on the disc. The extras are extra special and give a real flavour of how the story was made. The Holmes documentary is fine fare as is just about everything else on disc two but the whole thing is let down by the story itself, or rather, its execution. 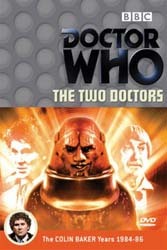 The Two Doctors is one for completists only.